Welcome to The Healthy Divorce Blog, your source for everything related to having a healthy divorce. So you live in the state of Pennsylvania, and you’re ready to get a divorce. Conveniently enough, your spouse is ready to get a divorce as well. This bodes well for the divorce process, because now both you and your spouse may not be subjected to some of the common aspects of a divorce that make the overall process so emotionally draining. 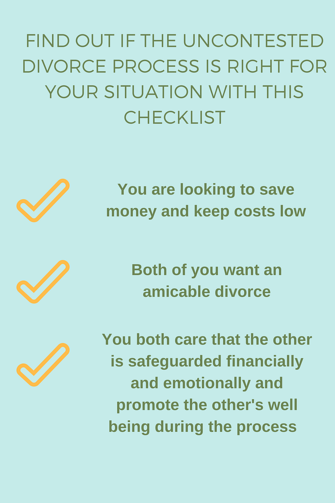 At this point, you and your spouse have both decided that divorce is imminent, and you are prepared to continue on in an amicable way. So what comes next? Well, there are a few options for you, but the one that I’m here to discuss with you today is the option of getting an ‘uncontested divorce’. Ultimately, you may not know all there is to know about the ‘uncontested divorce’ process in PA, so let’s try to dig deep and help you find the answers to some of the most frequently asked questions about this topic. FAQ #1: What is an uncontested divorce? 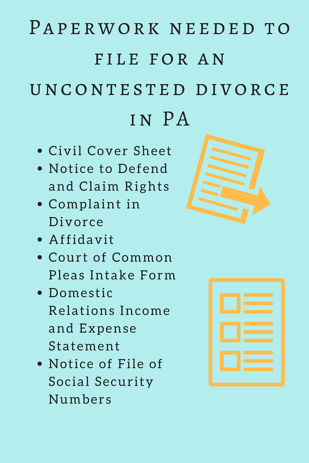 An uncontested divorce in PA can occur when both spouses agree to get a divorce and then fill out the necessary paperwork. When this happens, the divorce process becomes significantly shorter. Often times, a divorce can take years to finalize. With an uncontested divorce, the divorce can become final in as little as 3 or 4 months. It should be known that in PA, there are other names for this uncontested divorce process that are often utilized. Other names for this process include a ‘no-fault divorce’ and a ‘mutual consent divorce’. On rare occasion, the process is also referred to as a ‘c divorce’ because of the section of the law that permits this type of divorce process. FAQ #2: How do I know if I am eligible for an uncontested divorce? If you and your spouse both agree to the divorce, and sign the necessary divorce paperwork, then you are eligible to pursue the uncontested divorce. FAQ #3: What paperwork do I need to file during an uncontested divorce? Domestic Relations Income and Expense Statement: provides information about employment, insurance, etc. *It is important to note that some forms vary in parts of PA (such as Philadelphia). *It is important to note that a different set of forms must be filled out 90 days after the original forms are filed. FAQ #4: How do I go about getting an uncontested divorce? FAQ #5: How does an uncontested divorce differ from other types of divorce in regards to the 4 areas of divorce needs (alimony/spousal support, child support, division of marital property, and child custody & wellbeing)? Put simply, the aspect of an uncontested divorce that makes this process “uncontested” is the mere fact that there is some level of agreement about the terms of the divorce. This is not to imply that divorce mediators are not useful in hashing out the specific of certain areas of divorce such as alimony, child support, division of property, and custody, because they definitely are. However, you can anticipate that there is a certain level of compromise when discussing the terms of the divorce, which ultimately helps you and your spouse be civil towards one another while arranging the details of the marital settlement agreement. FAQ #6: Are there multiple options within the uncontested divorce process? During the uncontested divorce process you have multiple options which include mediation and independent filing. If you or your spouse feel that you can agree on the terms of the divorce without the need for mediation, then independent filing might be right for you. However, if there are aspects of the marital settlement that you disagree on, then a divorce mediator might be able to help you and your spouse sort through that agreement in an amicable way. You should keep in mind that there is also the option of inserting a marital settlement agreement into the filing process without the help of a mediator or an attorney. FAQ #7: Which option is best for me? If you and your spouse agree on everything regarding the divorce, then it might be time-saving and cost-efficient to file independently. However, if you disagree on even one small detail within the divorce terms, then a divorce mediator would be helpful in order to sort out those terms in a civil manner. It is important to consider that mediators operate with both you and your spouse’s best interests in mind. 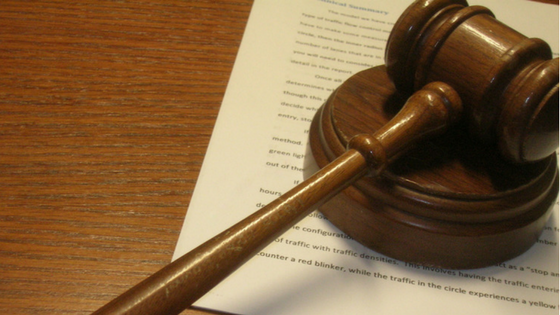 Therefore, if you hire a divorce mediator you can expect them to settle efficiently on a fair resolution. FAQ #8: Is an uncontested divorce process right for me? Do you like saving time? Do you like saving money? Do you want to have an amicable divorce in which everybody’s well being is safeguarded? Do you and your spouse agree that the answer to the previously asked questions is “Yes”? Well, then the uncontested divorce process is definitely a good place to start. It can save you time, money, and energy, while also helping you maintain your sanity and well-being during the trying process that is divorce. FAQ #9: What happens if the uncontested divorce process becomes contested? If at any point during your uncontested divorce you or your spouse no longer agree about getting a divorce, then a divorce will have to be pursued under the one-year separation rule. Well, there they are… the answers to 9 of the most commonly asked questions regarding uncontested divorce in Pennsylvania. Hopefully, at this point you feel a bit more comfortable with the prospect of divorce, especially knowing that there are less time-consuming, less expensive, and less frustrating ways to get a divorce. In this case, all you and your spouse really have to do is agree. And although that may sound like a tall task, it may actually be realistic if your spouse were to know just as much about the option of getting an uncontested divorce as you do now. Greg Gilston is a contributing writer with the Main Line Family Law Center's blog. He works as a mental health counselor and consultant, and has a variety of experience working with families, couples, groups, and individuals within the therapeutic process. After receiving a B.A. in Psychology and an M.A. in Mental Health Counseling, Greg will be continuing his education as a law student at Temple University pursuing a J.D. degree in their part-time evening program. Greg is hoping to move his career towards the intersection of mental health and the law, working as a collaborative lawyer on important family matters such as custody and divorce.